For those without a car, getting to work can be a daily battle with public transportation. “Accessible to public transportation” can also mean “there is one bus to the office that runs every 30 minutes on a good day.” If your commute makes you want to angry tweet WMATA every morning, then consider an office in Friendship Heights, a bastion of reliable public transportation. Friendship Heights sits right atop its own Red Line stop, making it easy for anyone to commute in- no matter if they live in the suburbs or Downtown. It is also a hub for 13 bus lines. Who knew that it was possible for 13 bus routes to end/begin in one convenient location? These lines connect Friendship Heights to the Maryland suburbs, Southeast DC, The Mall, Georgetown, 16th Street and more. Choosing a workspace in this neighborhood means an easier commute with less time on a Metro train or bus. Friendship Heights is a unique place at the crossroads of urban D.C. and suburban Maryland. It’s a bustling neighborhood with the transit, food and amenities of downtown areas- without their inconveniences. If the thought of missing another meeting because of a motorcade or using a briefcase as a battering ram to get on the metro concerns you, then it is probably time to make the move to Friendship Heights. “Work” and “home” do not have to be mutually exclusive. The location of your workspace should fit into your lifestyle. Loving the location outside of the office reflects in the work done inside of the office. Friendship Heights is a welcoming community with the benefit of being situated on Wisconsin Avenue, yet close to neighborhoods and parks. It’s normal to go out during lunch, walk around and enjoy the outdoors. There is something in Friendship Heights to fulfill whatever need you may have. Two grocery stores, Whole Foods and Giant, are convenient for picking up dinner on the way home. In the Chevy Chase Pavilion offices, you don’t even have to step outside for Starbucks, CVS, multiple restaurants or to use the metro- perfect for the cold weather. Ah, the best part of any workday. Eating. In Friendship Heights there is no shortage of options for breakfast, lunch, dinner or happy hour. Head up Wisconsin Avenue to Pete’s New Haven Style Apizza for one of the most delicious pies in town or to Chatter for a gourmet sandwich. Familiar chains such as The Cheesecake Factory, Cosi, P.F. Changs, Le Pain Quotidien, Chipotle and Maggiano's are available for any lunch needs. For a more formal setting, try The Capital Grille for an indulgent steak and cocktail. There are two words that never fail to excite hungry professionals: food trucks. They offer great food ready within minutes at a lower price than an average restaurant. Every day food trucks line Wisconsin Avenue; check Food Truck Fiesta daily for a list of the food trucks by your office. The options vary, but there is something for everyone whether that's Nepalese dumplings or Jamaican jerk chicken. It’s cheap, convenient, quick and there is always something new to try. What more could one ask for? If bar food seems more appealing, your dreams will come true at locally-owned Lia’s with ALL DAY happy hour every Monday and Tuesday. You can get a delicious burger and drink for under $20. Had an especially long day at work? Go with the beer “Supermug”- an outrageously large Oktoberfest-style mug that’ll wash down all your worries. Sitting at a desk is just one part of a workday. 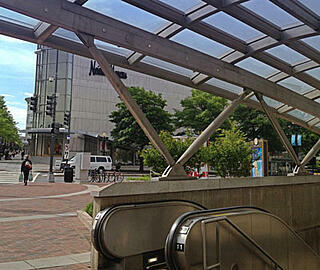 In Friendship Heights, an office will be close to a multitude of things to do before and after work, or as a break. Working out can be the hardest thing to incorporate into a busy day, but in Friendship Heights a variety of workouts are just minutes away. Hitting the gym creates endorphins, which signals feelings of happiness to the brain- and we could all use more of that in our day! Crunch Fitness has a full-service gym and a variety of classes ranging from hot yoga to boxing bootcamps. Tired of the gym grind? Try a dance class at Joy of Motion Dance Center and channel your inner Beyonce at a hip-hop class. Or, check out a class at RTR Pilates. If you’re addicted to Soulcycle, or have been dying to see what the trend is about, take the metro one stop to Bethesda and sweat it out in one of their classes. In need of some retail therapy? Whether shopping for fun or necessity, there is a store in Friendship Heights to fulfill any need. Lord & Taylor, Marshall's, TJ Maxx, H&M, J.Crew and Anthropologie are just a few of the clothing stores. For something different, check out World Market’s offering from across the globe in housewares, decor, food and toys. Sephora and MAC Cosmetics are around for any beauty needs and a brand new Michael’s is perfect for any craft fanatic. Workouts and shopping are great, but everyone needs to treat themselves sometimes. In Friendship Heights, all one has to do is walk outside their office to find different options for pampering and de-stressing. Varnish Lane is an upscale nail salon right off of Wisconsin Avenue. They use all-natural products for their manicure and pedicures and forgo water in their treatments to be eco-friendly. A few blocks down Wisconsin is Massage Envy. This location is open until 9:00 PM, so even if your day runs into night, you can still unwind. On a smaller scale, visit Sweet Teensy Bakery for a decadent cupcake or pastry. It may be number five on this list, but AdvantEdge Workspaces is number one in our hearts. Why? 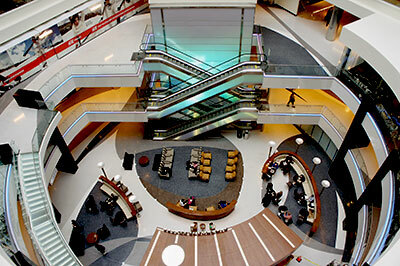 Occupying multiple floors in the Chevy Chase Pavilion, AdvantEdge has a work space to fit any need. The spaces are modern, functional and stylish. They offer small businesses or freelance workers amenities, like front desk reception and meeting spaces. No matter what the office needs are for your business, AdvantEdge has a space that will work for you. Using an AdvantEdge workspace provides more than just a desk to work at. There are full-service break areas with coffee and tea, lounges and common areas. “Bagel Friday” events close out the work week with a selection from Bethesda Bagels and cream cheese (and muffins if you’re early enough to snag one)! An office should not be a place you dread, it should be a welcoming place that you look forward to being in every day. AdvantEdge is a unique coworking space that works to help your business and provide a supportive work environment. It is a community of business people and a collaborative space- a perfect blend of privacy and socialization. Now that you know all that Friendship Heights has to offer your company- what are you waiting for? Learn more about working in the heart of it all at AdvantEdge Workspaces!